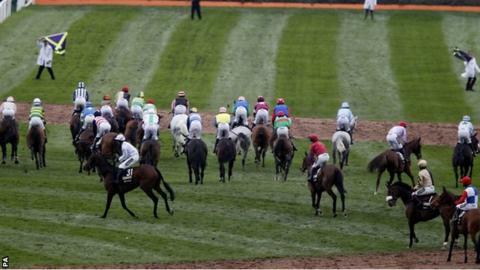 Grand National jockeys have refused to co-operate with a stewards' inquiry into a false start at Aintree. The British Horseracing Authority (BHA) said the inquiry has been adjourned to be held at its headquarters in London. All 39 jockeys who started the race, won by Pineau De Re, declined to attend the hearing, or send a representative. The BHA's disciplinary panel will consider the incidents at the start and whether to take action against riders for not taking part in the inquiry. A spokesman for the jockeys said they were "very frustrated about the conduct of the inquiry". The BHA said an assistant starter was knocked down as the riders moved towards the start. He was not thought to be badly hurt. Of the 40 jockeys in the National, only Brendan Powell - the rider of Battle Group - was not involved in the dispute, because his horse planted itself and would not approach the start. The exact reasons for the riders' anger were not immediately clear. An initial inquiry took place after the National, which was attended by most of the 39 riders who took part in the contest, and where 18-time champion AP McCoy acted as their spokesman. But when the hearing was reconvened following the day's final race, all the jockeys refused to take part. Professional Jockeys' Association chief executive Paul Struthers said: "I wasn't invited to be present for the initial hearing, but I know that certain conversations took place between jockeys and stipes [stipendiary stewards ] afterwards, and the jockeys - to a man - decided that they would not take part when the hearing was due to re-commence. "Only one of them would have needed to be present, but they all decided that they would not take part. "Timewise, a number of the Irish jockeys were under pressure to catch ferries and flights, but that wasn't the reason why they refused to go back in. They all agreed that they just weren't happy about the way in which matters were being conducted." Stewards said the welfare of assistant starter Simon McNeill, who was knocked over, had been compromised. BHA spokesman Robin Mounsey said: "While we regret that the jockeys refused to return to the stewards' room to allow the inquiry to be concluded, the referring of the matter to the disciplinary panel will mean a re-hearing and hopefully an opportunity to take this matter forward in a more constructive manner. "Not all of the jockeys will be required to attend. They will be able to nominate representatives to attend the hearing. This is not the first time the Grand National has been marred by a false start. In 1993 the race was declared void after 30 out of 39 jockeys failed to realise a false start had been declared. Seven riders completed the full course - forcing a void result. The race was 'won' by 50-1 shot Esha Ness. "It is undoubtedly a challenge to hold such an enquiry with such a number of riders in the aftermath of the Grand National." The controversy followed a thrilling race in which all runners and riders returned safely. "Yes, it is a shame that it has come at the end of three great days of racing, but they felt very strongly that matters were not being conducted correctly," said Struthers. He has contacted his counterpart at the Irish Jockeys' Association, Andrew Coonan, and solicitors. "What we need to do now is establish a timeline as to exactly what happened and we will take it from there," he said. "Copies of the DVD of footage of the incidents will be distributed to everyone and a hearing will be called by the BHA. I've spoken to Simon and he's fine."